Trace history in your watershed! *NOTE: This tour is full. We are currently adding names to a waiting list. 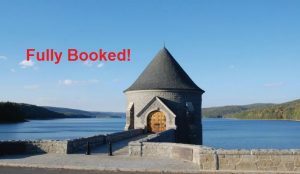 Join us for a tour deep inside the bowels of the Saville Dam followed by a trek to some of the old Barkhamsted foundations spared inundation as the Barkhamsted Reservoir filled. We complete our tour with a visit to the relocated and renovated old Barkhamsted Center schoolhouse. The history and preservation of our watershed is interwoven with the story of the Metropolitan District and the pursuit of clean drinking water for Greater Hartford. The operator of the Saville Dam will guide us through the earthen embankment impoundment that backs up the 30 billion gallons Barkhamsted reservoir providing drinking water for Greater Hartford. After touring the dam, we venture onto the reservoir lands where the MDC forester will explain how the MDC manages forest diversity for water quality. 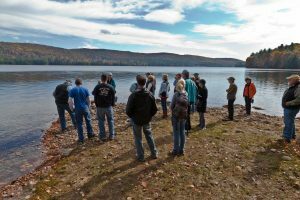 Then Barkhamsted Historian, Erik Landgraf will tour us around the relics of old Barkhamsted Hollow, a village mostly flooded by the creation of the Barkhamsted Reservoir in 1940. Structures that were not flooded were torn down or moved by the water company, but not without a trace. Mr. Landgraf will bring the old town roaring back to life as he regales us with vignettes of life in the village, as past and present eerily meet. Then it’s hands on in the old Barkhamsted Center schoolhouse; we’ll see what you remember from your school days. Pre-registration is required, space is limited, contact FRWA at (860) 658-4442, or email: river@frwa.org to register; Tour begins at 10:00 am, dress for the weather, wear footwear to walk in the woods and pack a lunch and water. Please add me to the wait list for the dam tour for two of us. Thank you!